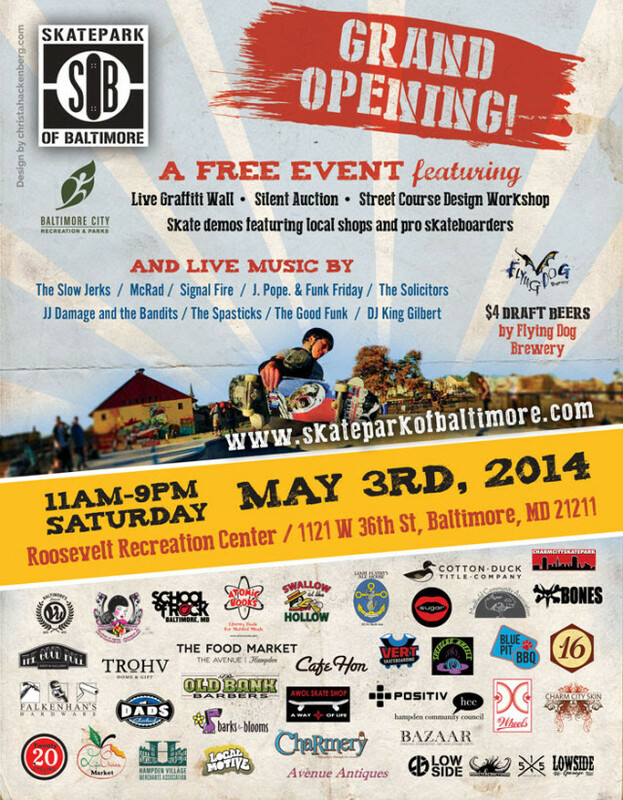 (Baltimore, MD) The Skatepark of Baltimore is hold­ing an all-​​day, free grand open­ing event cel­e­brat­ing the com­ple­tion of Phase I of a pub­lic, professionally-​​designed skatepark built at Roosevelt Park in Hampden on May 3, 2014 from 11:00 a.m. to 9:00 p.m.
For the past nine years, the all-​​volunteer non­profit has advo­cated on behalf of the 30,000 skate­board­ers of Baltimore to build a world-​​class, con­crete skatepark in the City of Baltimore. 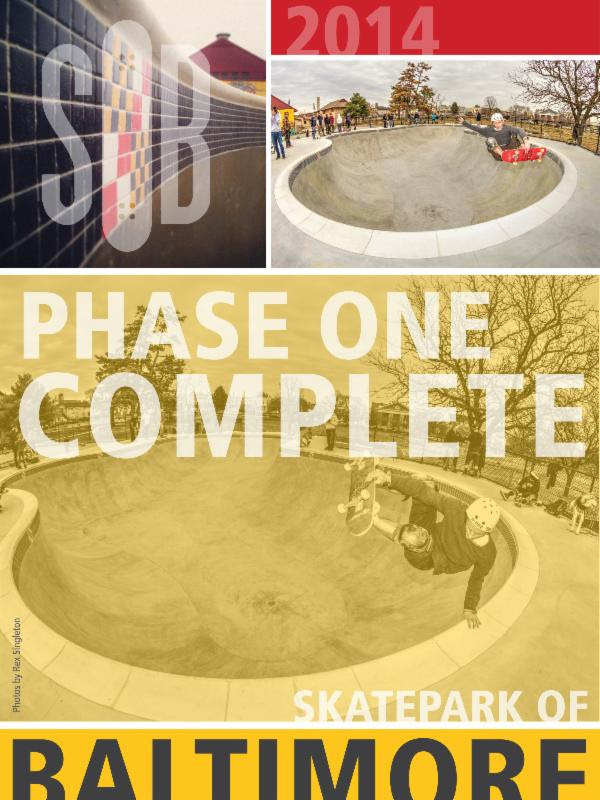 Thanks to its part­ner­ship with the Baltimore City Department of Recreation and Parks (BCRP), the first phase of the skatepark, a 5,000 square foot con­crete bowl and sur­round­ing banks, was com­pleted in February. The nationally-​​recognized firm, Artisan Skateparks, con­structed the skatepark based on local community-​​led designs. Phase I of the $180,000 project was funded by dona­tions made to the orga­ni­za­tion and matched by BCRP. Fundraising for Phases II and III are under­way, with plans to com­plete the entire park by 2016. Ernest Burkeen, BCRP Director, and Stephanie Murdock, Founder and President of the Skatepark of Baltimore, will lead open­ing remarks for an esti­mated crowd of 1,000 well-​​wishers at 12:30 p.m. Dave Duncan, Pro Skateboarder and voice of World Cup Skateboarding, will be the Master of Ceremonies for the day-​​long event. Speaking at the cer­e­mony will be mem­bers of the Baltimore City Delegation to the Maryland State Legislature (District 40) includ­ing State Senator Catherine Pugh, Delegate Shawn Tarrant, and Delegate Barbara Robinson. The cer­e­mony will also be attended by mem­bers of the Baltimore City Council: Bill Henry, District 4, Carl Stokes, District 12, Nick Mosby, District 7, and Mary Pat Clarke, District 14. Representatives of the Office of the Honorable Stephanie Rawlings-​​Blake and the Office of Council President Bernard C. “Jack” Young will also be in attendance. The event will fea­ture live music through­out the day and skate demon­stra­tions by local and regional shops includ­ing: AWOL, Charm City, DC Wheels, and Vu Skate Shop. Activities will include a graf­fiti wall and skatepark design work­shops. Refreshments will be avail­able in a beer gar­den serv­ing Flying Dog and food from area merchants. Founded in 2006, the Skatepark of Baltimore, Inc. is a 501 © 3 non­profit orga­ni­za­tion ded­i­cated to build­ing a pro­fes­sion­ally cus­tom designed, pub­lic des­ti­na­tion con­crete skatepark at Roosevelt Park in Hampden, a neigh­bor­hood located in north­west­ern Baltimore. The orga­ni­za­tion antic­i­pates that once the park is com­pleted, it will serve as many as 100 youth a day and up to 36,500 a year. Congrats, Steph and the city of Baltimore on your new skatepark!